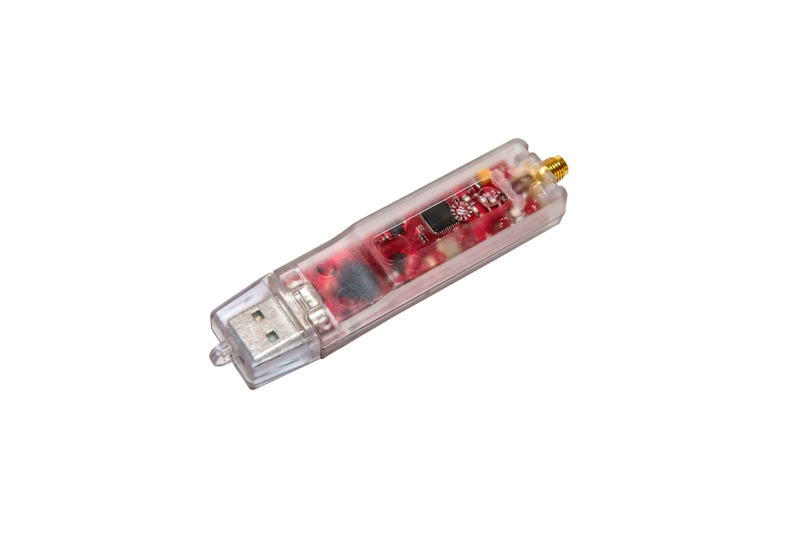 The SharkRF OpenSPOT is a stand alone easy to use digital hotspot for amateur radio operators. It’s support various digital modes like, D-Star, DMR and C4FM. This unit as an integrated web interface, no Linux and no Windows to managed. Everything is integrated in this very high quality little box. 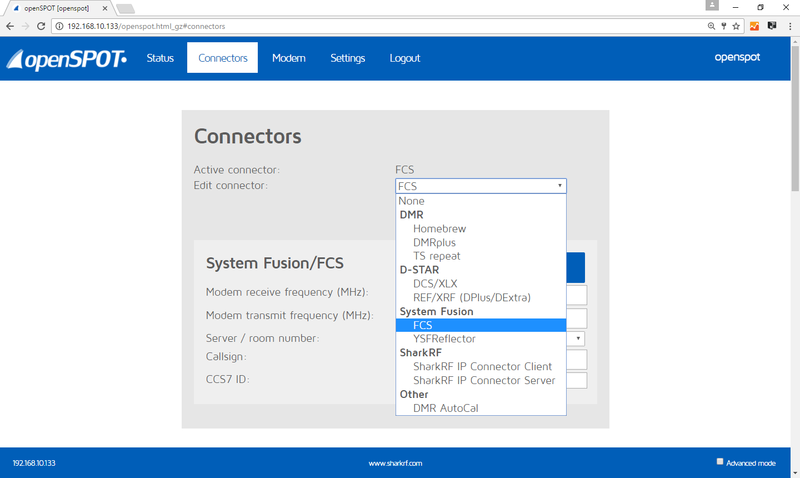 It also supports cross mode between DMR and C4FM (DN), you can do C4FM with your favorite DMR radio or you can do DMR with your favorite C4FM radio, this will help saving your precious radio money. FYI: There’s no AMBE chip in openSPOT. Cross mode works by recalculating the FEC used in DMR and C4FM. The AMBE data is not touched, as it is the same in C4FM/DN mode as in DMR. I received the unit in the beginning of August 2016, I’ve been using it ever since. 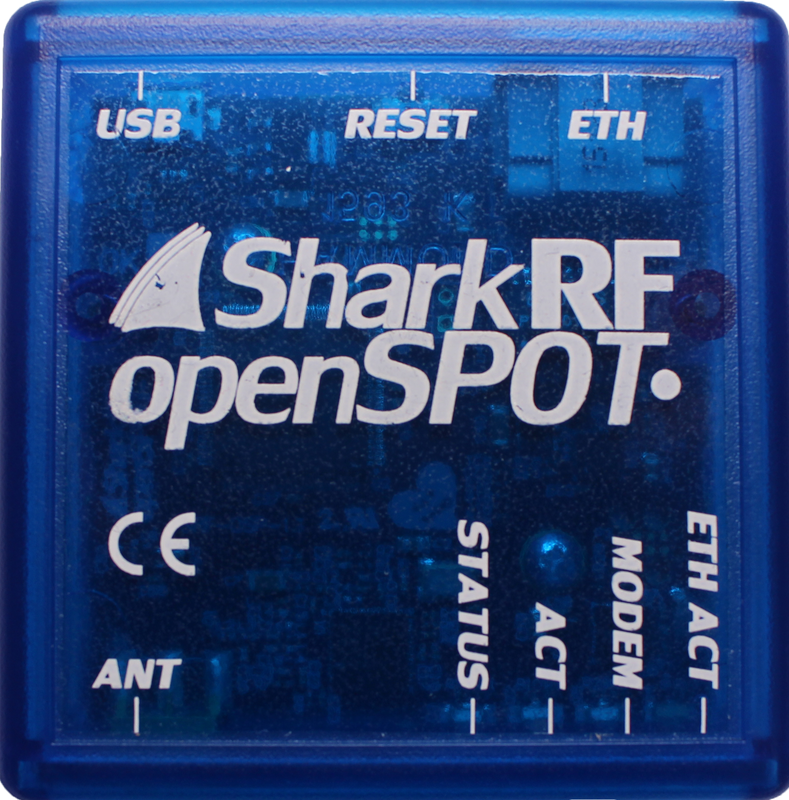 Shark RF provides frequent software upgrade which improved the performance of the OpenSPOT every time. Beside the excellent and easy to use web base interface, it just looks nice. The physical box itself is very well built and I can feel the quality of the unit. The OpenSPOT stay still on a table since it’s pretty heavy considering its size, no problem holding the network cable (cat. 5). 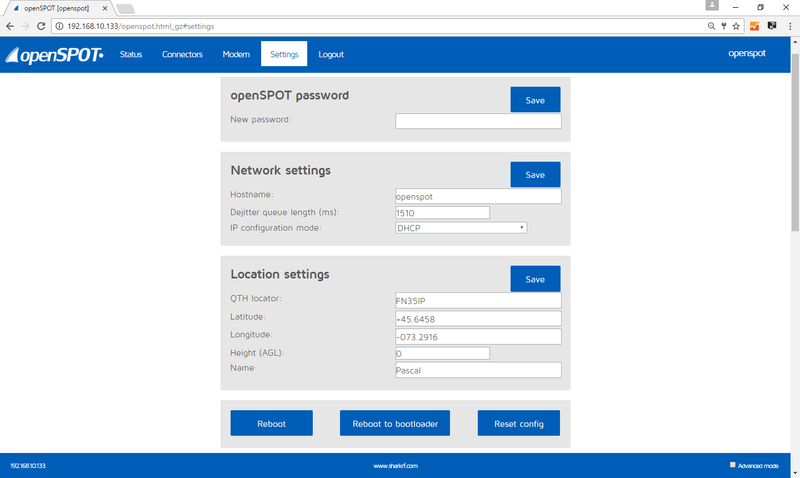 When you first plugin your OpenSPOT connect the USB cable to your computer and type this address into your web browser http://openspot.local you will then see the web interface. If it does not work you will have to find the IP address of the device. 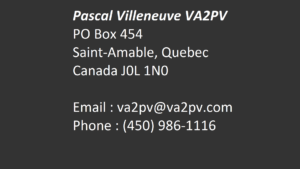 From there you will be able to note the IP address in the address field of your web browser. In the future you will now be able to connect the unit directly without being connected to the computer. 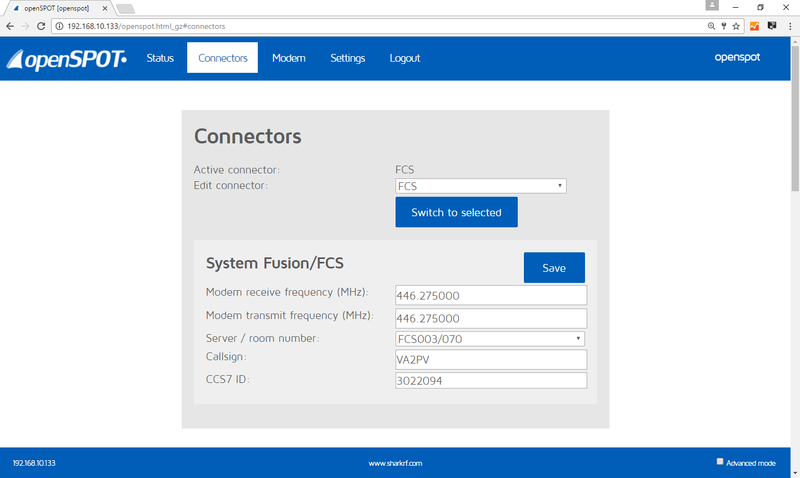 You can now use the included power pack and connect to the web interface directly with the IP address. The default password is “openspot”. After you login you will be on the status page, showed below. Into the connectors tab you can set the desire mode. 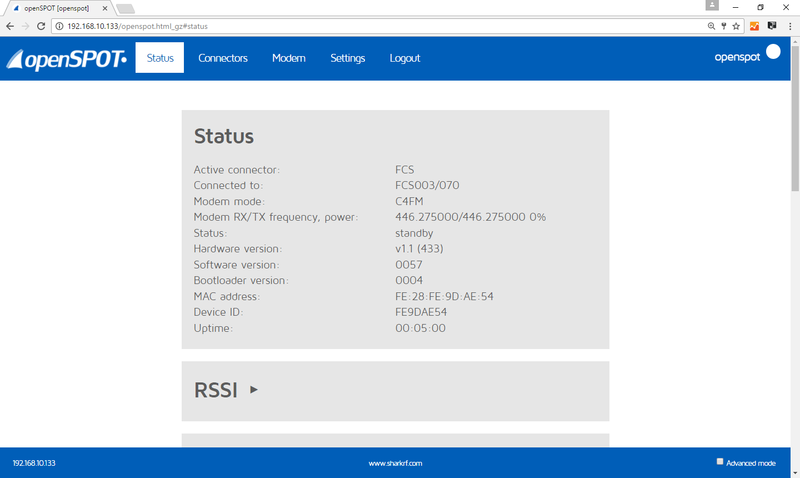 You can also setup a server where you can setup with your friends or between repeaters a direct IP to IP point to point or point to multipoint connections! This is awesome and also very cool; this setup provides the best performance possible between the connected device because they don’t have to go thought a reflector (adding delay into the process) that is maybe further away then the end station itself. The first time you use it you will have to set the frequency, your DMR ID (CCS7 ID) and your callsign. In order to use the OpenSPOT you must obtain a unique ID which is coordinate worldwide as a digital ID. For all digital plateform. You cannot just enter your call sign in the OpenSPOT interface, you must enter the DMR unique ID, this will give you access to all the reflectors and all modes. You need also to make sure you are register to the D-STAR trust server in order to use this mode. In this section you also select the desire reflector. 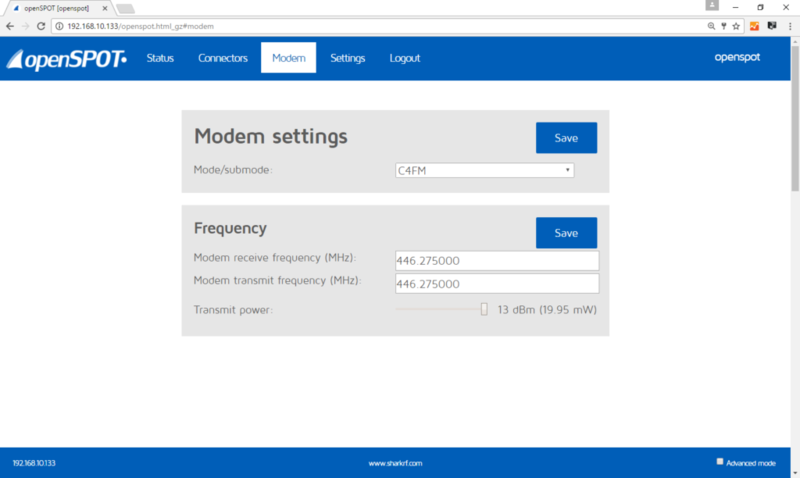 In the modem settings section, you can also set the sub mode, this is for setting up the cross mode function between DMR and C4FM. 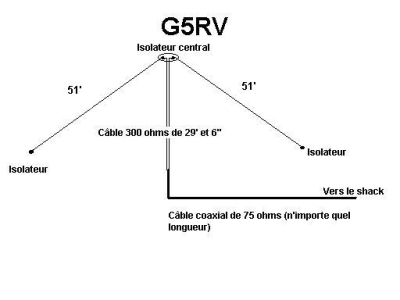 If on the connectors page you are connected to a C4FM reflector and you set here the sub mode to DMR, you will be using a DMR radio on a C4FM network! You can also set the TX power from here. In the settings tab, you can set a new password for the unit, some network settings, your local settings like your grid square information and you name. From this section you can also reboot the unit, reset the config and reboot the unit in bootloader mode for the software upgrade (see SharkRF video further below for the procedure). There is also an advanced mode that you can check in the bottom right corner, this will give you access to more sophisticated options. 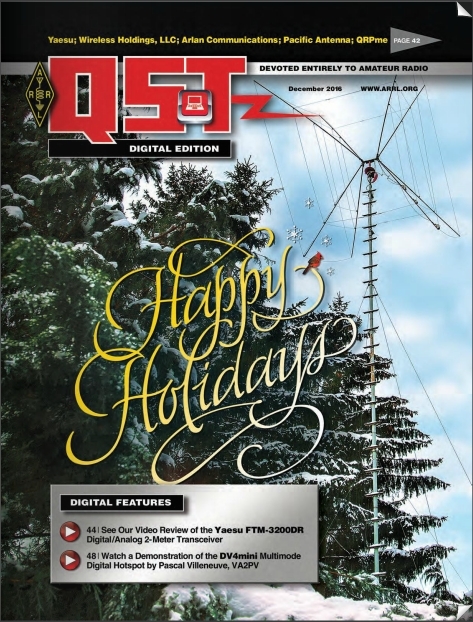 This unit definitely worth it and it is a very good addition in the ham shack and the service from the manufacturer is very good. You can buy with confidence. 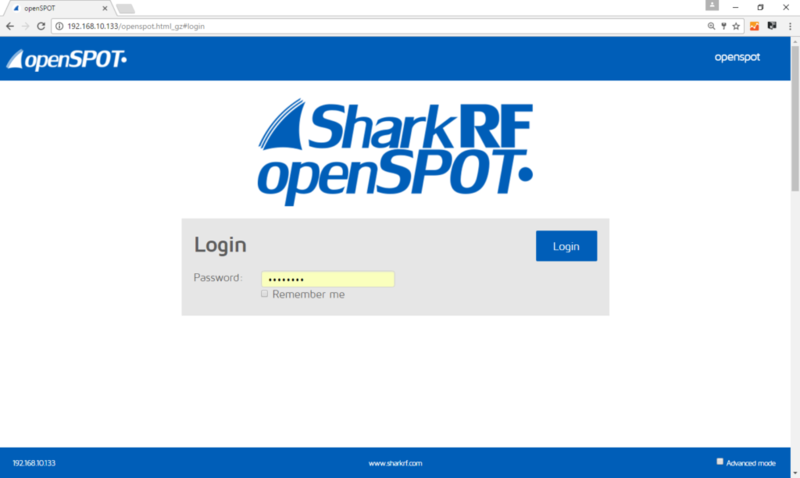 Part1 – SharkRF OpenSPOT review – Web interface and first tests. Special thanks to Bill W1KFR for helping me with this video. 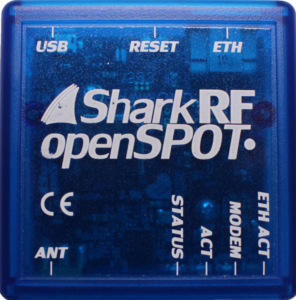 This is the part 2 of the SharkRF OpenSPOT review. In this video I demonstrate the crossmode between Yaesu Fusion C4FM and DMR. Side by side demonstration. Here’s the setup with the frequency information. A short introductory video in which you can see openSPOT working, the desktop and mobile web interface, and hear the DMR voice quality in two short echo tests. This tutorial video shows how you can enter openSPOT into bootloader mode and do a firmware upgrade. Note that you need to plug the USB cable to a computer! This tutorial video shows how you can reset factory default settings on an openSPOT. This tutorial video shows how you can connect openSPOT to BrandMeister with a C4FM radio. There’s a quick demo showing cross mode operation. This tutorial video shows how you can connect openSPOT to the BrandMeister network.